Monday Booze News Negroni Week 2017 Edition! First, a little history via James Bond. Because bitters were his first love. And for even more history on the drink, check out the book by Gary Regan! Not sure what bars in your neighborhood are participating this year? Check out this bar finder and see what charity your bar is supporting. Pins are so hot right now. And you can have your very own Negroni version to rock out with this week. Negroni lollipops. They’re a thing you should eat. And speaking of eating, if you’re in Los Angeles this week, check out Break Room 86 and enjoy a Negroni Ice Cream sandwich. Because… ice cream (and because we’ll be stopping in Wednesday night for a special cocktail surprise. Watch for details on Instagram!). 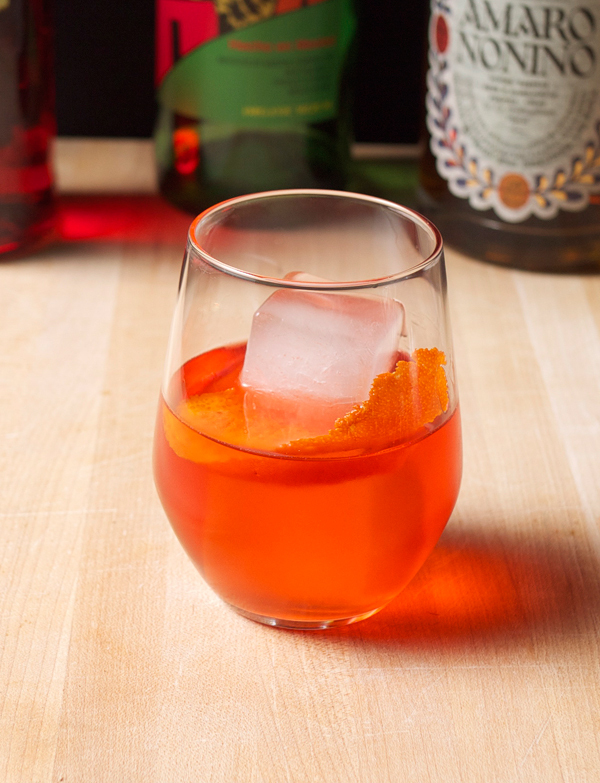 Did you check out our Negroni Week post? We got all the details on what it is, AND THREE NEW COCKTAILS for you to enjoy. You can also eyeball our other Negroni riffs from years past. Coconut. Coffee. Go get ’em. Accessorize your ensemble this week with a Negroni bandana and $2 of each sale will benefit the San Francisco Marin food bank! And lastly, we’ll be out and about all week supporting our favorite bars and charities. Stop on by our Instagram and say hi and let us know where you’re going! Negroni Week Starts June 2nd! And here's a Mezcal variation called Viva Negroni! Negroni Week is almost upon us folks. Starting June 2nd through the 8th, bars across the country will be donating proceeds from every Negroni or Negroni variation that they serve all in the name of charity. Drink and be good to your fellow man. More info can be found on here (Imbibe and Campari are putting the whole shindig together). Find a local bar and help participate for a good cause. You’re out drinking anyways. While I also will be out and about that week seeing what Los Angeles bars have concocted, I’m also offering up a favorite variation here on the site that you can try all year round. I’ve swapped out the gin with mezcal (because I can’t help myself), and the sweet vermouth with Amaro Nonino (I don’t need a reason other than to tell you I love this stuff). 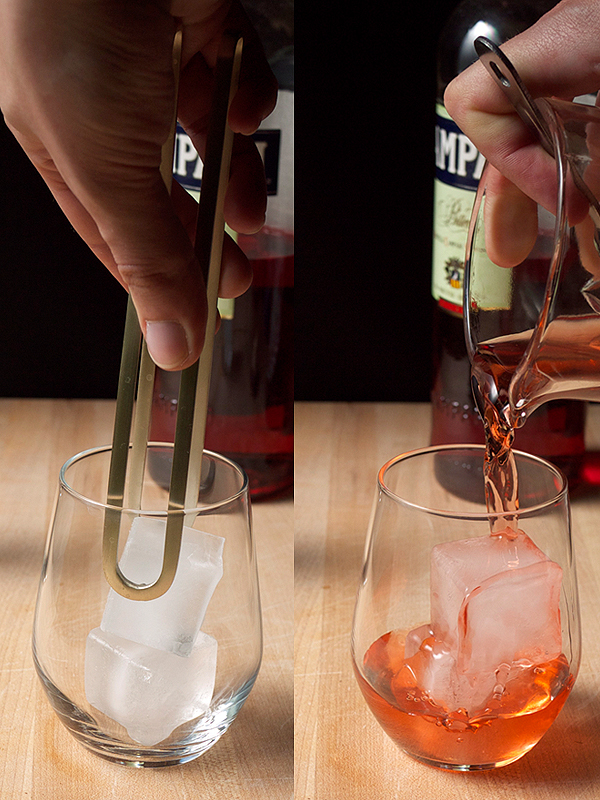 The Campari stays the same. In a mixing glass 2/3 filled with ice, stir together the mezcal, amaro and Campari. Strain into a chilled rocks glass. Express orange oils over the ice and plop the peel in the glass. Bright, juicy citrus battles it out with the mezcal and licorice on the nose. The first sip is rich, smooth with a not subtle bitter hit from the Campari immediately with the earthiness of the mezcal right behind. Campari can really stand up to the aggressive nature of the smoke in a mezcal and I love pairing them here. The Amaro Nonino adds some spice and complexity, as well as a nice mouthfeel to the whole drink. 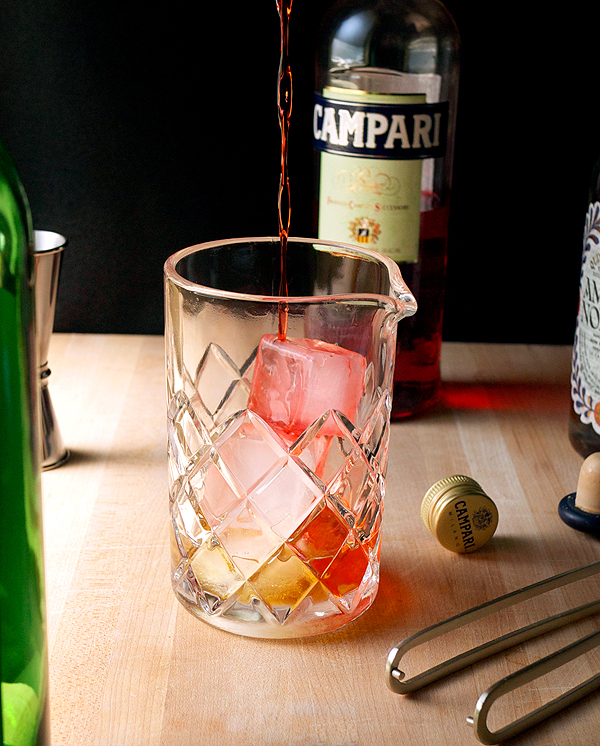 Do you have a favorite Negroni variation? Or do you prefer the old tried and true recipe? Also, don’t forget that Stir & Strain is running a GIVEAWAY (check it out and enter).